5 Mindset Tips To Implement Right NOW! By now you should know, from the various articles I have written on the FLC blog and what I talk about in my emails, is that fitness no matter what the end goal, starts in the mind. In-fact, everything you do in life starts up in the mind. Making decisions, finalizing a project, relationships, business, love – they all start up in the mind. Being fit and healthy is a life time commitment. You can’t just believe that by doing a few exercises on random days of the week you’re going to burn fat. It doesn’t work that way. That being said, you need to have a plan of action, but before that you need to want to change. I will always be there for my friends and family. Whenever they need me I’ll be there, and if they reach out and ask for my help I will help them. You can’t change someone’s way of thinking if they don’t want to be changed. By just changing your frame of mind, will change the way you look at life. I’m currently reading a book by Dr. Daniel G Amen “Change Your Brain, Change Your Life”. And what he says is if your deep limbic system in your brain (the part that controls emotion, appetite, sleep cycles, and has a direct link with depression etc) is overactive, then you’re very likely to see most things in a negative light. He even goes as far to say that if you had ten people in a conversation, 9 of those people would come out with a positive outcome, yet the person with an overactive deep limbic system would come out with a negative outcome. Your thoughts will control how you feel – if you let them. If you think negatively you’re likely to become quite negative in the way you talk and the way you see life in general. If you think that you have no chance of ever losing weight, then the chances are you won’t. 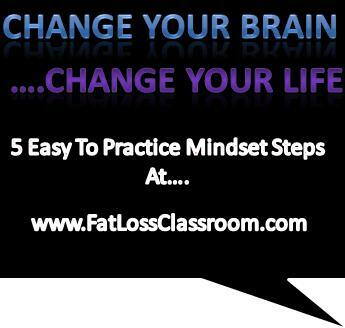 So with that said, I have given you 5 mindset tips you can implement right away. By just putting these steps into practice you can not only start to change the way you think in general, but you can start to have a whole new outlook on life itself. I briefly went through this one above. It basically comes down to this; if you don’t want to change – you won’t. You must have the desire to change. If lack of motivation is the problem, then planning and goal setting might be the next step you need to take. Are you someone who always looks for the negative in a situation? Do you always try to blame someone else for thing before looking at yourself? Or maybe you’re forever laying guilt on yourself saying things such as “I should have done that….” Or “Maybe I ought to have done this…”? If you are then, you are doing the opposite of thinking positively. Thinking positively will take time; it’s not going to happen over night. You need to make a conscious decision at first. Next time something bad happens, instead of thinking “bad things always happen to me”, try and look for a positive. I use this nearly every day of my life, and I am yet to fail to find some sort of positive. This one simple technique helped me start pushing myself out of depression. “Jim Makes me Feel Rubbish about Myself” – Why You Spending Time With Him Then?!? You can be in the best mood you have ever been, but walk into a room with a negative mood, and watch your good mood drop. Surrounding yourself with the right people is vital for you to succeed in life – whether that is in fitness, business, relationships or any other part of life. What’s holding you back from achieving your dreams? You need to hit those problems head on and get rid of them. You have as much right as anyone else on this planet to be successful. Why should something or something hold you back from achieving what you to do? Again, planning and goal setting might come in handy here. What is your goal in life? What do you want to achieve by this time next year? How are you going to achieve that goal? I personally think we’re not given any where near as much help as we should be given when it comes to goals setting. Everyone has dreams – some big, some small. But not everyone has the knowledge to go get those dreams. If you have a goal you want to achieve, then you need to break that goal down into smaller goals. So a yearly goal could be split up into four 90 day goals. Each quarter you would focus on achieving a specific smaller goal – achieving all 4 of those smaller goals will hopefully lead to you achieving your yearly goal. I’ve said it before and I’ll say it again, before you even think about buying a gym membership or starting an exercise program, you need to plan exactly what you’re going to do. Having a goal to reach helps you stay focused. If you’re someone who just decides to exercise now and again, reaching any sort of goal is going to be difficult. It all comes down to planning and taking action. Without planning, you won’t no exactly what to do to reach your goals. Without taking action – you won’t get anything done.